Item #17327: 14Kt. 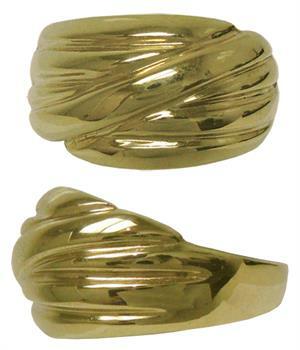 Yellow Gold polished scalloped dome ring of 5.61 grams. Size 8. Item #SHU-N421: 18" long Rhodium-plated Sterling Silver & 18Kt. Yellow Gold necklace with 16.5mm round pendant, round Diamond of .027 Cts and spring ring clasp. Item #SHU-N481: 18" Rhodium-plated Sterling Silver & 18Kt. Yellow Gold necklace with 17x23mm oval woven design pendant with lobster claw clasp. Item #SC-TPGD-170-X1: 12mm round 14Kt. Yellow Gold Greek key design tie tack. 1.12 grams TW. Item #SC-TPGD-45: 3/8" x 1/4" 14Kt. Yellow Gold tie tack. 1.09 grams TW. 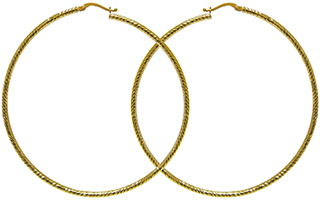 Item #SC-TPGD-67: 10.5x10.5mm 14Kt. White & Yellow Gold X design tie tack. 1.36 grams TW.